I have a tiny window to put together a post and decided to use that time for a very quick (and haphazard) recap. Forgive the mind-spew. Once I have more time I PROMISE to share a more organized post! We helped friends celebrate two birthday parties in one weekend. Fun, but exhausting. At least they were on separate days! Trust me, we have pulled double events on one weekend day. That can take quite a toll. ESPECIALLY with a toddler in tow! 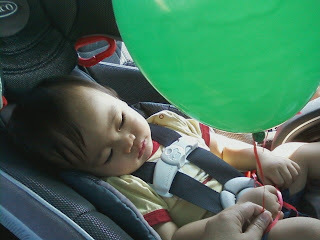 Luckily, our guy is mellow - so even if overstimulated and lacking a nap, he is still pleasant. POOPED by the end of the day, but in no way a terror. Well... not that we have experienced yet. Knock on wood. Not YET. Thank goodness for that. Thank goodness for NOW. We are smart enough to know that this can change at the drop of a hat! Will we be prepared? Probably not. But at least we are open minded and willing to adapt. 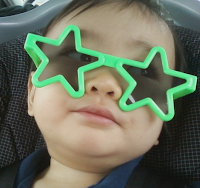 Note: If you look closely, you could see our son rolling his eyes at me under the star shaped sunglasses! He's humoring me by letting me put them on him. I'm loving his "hurry up mom, take the picture already" expression! I hope that you all had a great weekend. Please share your stories of your adventures. Or - if you have tips to share on how to handle a toddler meltdown, I'll gladly accept those! It may come in handy for the future. Thank you. @E @ Act Fast Chef: Very Elton John, right? I thought they were a riot! I'm glad our son kept them on long enough for me to shoot a photo. Thanks for stopping by. I need to visit you now for some ideas for the week! I love busy weekends. We just got back from Tagaytay and it was not stop activity from the time we got there. Your son is too cute! @Rachel Joy I LOVE your family adventures! I'm glad for celebration weekends and fun packed ones too. I am just left feeling so tired afterward. :) It is always worth it though! What a cutie pie and I just adore those star glasses. I'm now a new follower (vB). How adorable.. Looks like he had fun! I'm your newest follower from VB hopper mania. Looking forward to reading more from your blog. Just became your 70th follower, I found you from the VB hopper mania. Hope you will drop by my blog at kittycrochettwo.blogspot.com when you get a chance. Have a fantastic Sunday. 2 parties in one weekend would require me to nap. So cute with those glasses on. Love the pictures. New GFC follower via vB Hopper Mania!